The Copenhagen UN Climate Change Conference addresses unparalleled environmental crisis and the need to transform our relationship with nature. Many people assume that nature has no place in the city. On the contrary, cities are central sites for a sustainable, post-industrial era that supports population growth and a high quality of life. Biodiversity and urban forests can thrive with concrete and people. Ordinary gardeners and environmental visionaries in Tokyo, the world's largest metropolis, are improving urban life for human and environmental benefit. While mainstream environmentalists work to save distant forests, urban innovators are creating new shared places that connect city residents to the environment and each other. Successful strategies include maximizing limited resources, engaging urban dwellers, and sharing daily life with plants and wildlife. Tokyo's size, density, lack of open space, and past policy failures paradoxically make it a model for rebuilding mature cities and designing hundreds of new cities. Along with climate change, the world faces unprecedented urbanization, reaching 60% of the world population or 5 billion people by 2030. African and Asian urban populations will double between 2000 and 2030. To make cities sustainable and attractive, limited resources must be used for maximum benefit. Tokyo already offers vibrant and safe street life with relatively small private spaces. Because of usage fees and public investment, more daily trips are made by transit, walking and bicycling than automobile. 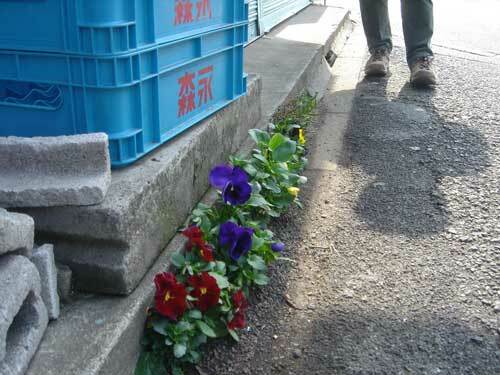 And large numbers of often elderly residents tend gardens spilling out from homes into streets. With minimal horizontal area between homes, Tokyo residents are experts in blurring public and private spaces, and growing vertical gardens in even the narrowest openings. Japan's love for miniaturization is aligned well with dense urban living. Kobayashi Kenji revitalizes bonsai by appealing to young city people's desire to connect with nature. Traditional bonsai trees that are over one hundred years old are a pastime of corporations and wealthy elderly men. Kobayashi employs more humble plant material and invites city dwellers to treat plants as members of the family, like pets. Daily care for plants connects city dwellers with nature, seasonal change, and growth. A rice paddy in the middle of Ginza captivated Tokyo residents this year by bringing a cherished cultural activity into the heart of the city. On a vacant lot between demolition and construction, Iimura Kazuki's Ginza Farm created an open community place frequented by shop clerks, construction workers, office staff, children, and neighbors. Two ducks weeded the field, contributed fertilizer, and educated the public about natural farming. Adapting rice farming to Tokyo's ambient light and warmer nights required installing a tall black curtain to "help the rice sleep." The Ginza Bee Project also creates space in the city for another stressed rural practice. Colony collapse disorder worldwide is linked to agricultural pesticides. Strangely, cities now provide a healthier habitat for bees than the countryside. Ginza's bees increase Japan's honey production and raise awareness about the relationships between bees and food, people and the environment. These 300,000 honeybees inspired companies and individuals to become urban beekeepers. "I am not interested in greening," Yamada Yoriyuki, an environmental leader at Japanese construction giant Kajima, surprised me. Instead of applying green to existing projects, Yamada emphasizes the value of biodiversity and culture for new urbanism, with special attention to bees, falcons and the Japanese Pygmy Woodpecker. Kajima and a new corporate alliance, the Japanese Business Initiative for Biodiversity, explore new ways to connect development with habitat creation. Another urban visionary is Professor Suzuki Makoto at the Tokyo University of Agriculture who is building a firefly habitat at a middle school with students, teachers and the local community. Fireflies have a magical appeal to children and adults, and are a natural gauge of the healthiness of urban environments. Fireflies require clean running water, near total darkness at night, and plants that feed and shelter them. All of these urban ecology projects evoke the Japanese idea of satoyama, a balance between people and nature forged over two thousand years of rice farming. Unlike wilderness untouched by human activity, satoyama is a cultural landscape resulting from concentric rings of village, rice fields and surrounding forests. As Japanese increasingly abandon the countryside, bringing the average age of farmers to 60, reforestation has become a 21st century threat to the nation's biodiversity. Meadows and sunlight recede in rural areas, while the ideal of a balance between people and nature migrates to the city. Creating an urban forest in Tokyo faces many challenges, including uncovering Edo-era rivers and canals buried in concrete and freeway overpasses. Dramatically reducing surface pavement will revive the soil, exponentially increase plant mass and urban wildlife, and reduce stormwater flooding and Tokyo Bay pollution. Even the most overbuilt city contains underused spaces, including roofs, walls and streets. All that is missing is for governments and corporations to connect with residents' passions and potential for action. Urban ecology intertwines the health of soil, plants, animals and people. Biodiversity provides a natural connection between immediately improving our quality of life and addressing grave public policy issues such as climate change, energy independence, national security, food safety, crime reduction, air quality, and public health. Tokyo's lessons for sustainable cities range from the importance of culture in creating meaningful public places, to the role of biodiversity to remake even the densest metropolis.